Her new book is The Baby Chase: How Surrogacy Is Transforming the American Family. Two of my favorite writers came out with new books recently: Pat Conroy's The Death of Santini and Donna Tartt's The Goldfinch. I also was given a gem from the 1950s: Good Morning, Miss Dove. Lastly, my sister told me to read Stephen King's Dolores Claiborne, which I had somehow missed when it was originally published in 1992. I loved all four books - and they couldn't be more different from one another. I believe that Stephen King is the most underrated writer of my lifetime, and I am awestruck by his range, productivity, ability to work a plot effortlessly, and love of writing. Most recent King favorites include 11/22/63 and Joyland. I have been a Donna Tartt fan since she published The Secret History, which I read at least three times for its terrific, bizarre plot and memorable, chilling, fascinating characters. Every word of her third book, The Goldfinch, was a delight, almost making it painful to read, like the paradox of enjoying a square of delicious chocolate while agonizing the whole time, "But it's almost gone." I can't wait to read it again. 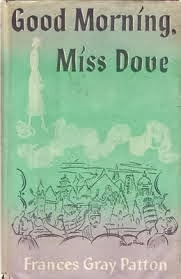 Good Morning, Miss Dove had that old library book smell that I recall from Minot-Sleeper Library in Bristol, New Hampshire -- where I spent most summers. I love the odd sensation of reading a book that seems so ancient, I wonder if anyone else I know has even heard of it. Lastly, Pat Conroy. What can I say? The truth of Conroy's childhood was even worse than what shows up in his fiction. According to Conroy, his first editor told him he had to add good qualities to the Great Santini, or no one would find the character believable, and so Pat Conroy had to invent positive attributes for his abusive, terrorizing father. I love Conroy's fiction -- The Prince of Tides showed me the upside of having a crazy family, in that it provides great material. But I find his two memoirs even more interesting and intimate than his fiction.